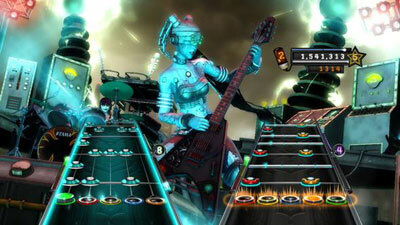 The rhythm genre exploded onto the scene in a big way with the release of RedOctane’s Guitar Hero and Harmonix’s Rock Band, but in recent months the genre has seen a steady decline both in sales numbers and overall popularity, which begs the question: is the genre in danger of fading back into obscurity or is there still hope for it to regain its place atop the sales charts? Remember the first time you ever played Guitar Hero? It was an awkward, screechy-sounding mess of a moment, wasn’t it? Even the game’s easy mode, which consisted of slowly scrawling single notes, was enough to tie your untrained fingers in knots. And yet, it felt amazing. Sure, in reality, you were utterly butchering rock ‘n’ roll classics in your living room, but you sure as hell felt like an actual solo-nailing, crowd-wowing rock star. It was damn near magical, and in that moment, you knew the world of gaming would never be the same again. Then came Rock Band and its full complement of instruments and vocals, and the rhythm genre became a fixture in our gaming lives. Plastic instruments began to invade living rooms all across the world, and publishers made a mint in the process. Sadly, the genre, which saw incredible growth in the wake of Guitar Hero and rival Rock Band’s success, seems to be in a state of slow and steady decline lately, with sales down since 2008; most tellingly, Guitar Hero’s latest entry, Warriors of Rock, tallied less than 100,000 units sold in its first month. It’s a far cry from the genre’s heyday, which begs the question: What happened? Was it matter of too much, too fast or has the novelty of the experience simply worn off? The obvious answer is a combination of both factors. The market quickly became saturated with a multitude of spin-offs, expansion packs, and annual sequels, leading to a bloat of titles and songs; this, coupled with a significant portion of the fanbase whose interest never blossomed beyond an initial infatuation, contributed to the relatively poor sales. If you’re a glass-is-half-empty type, you could interpret it as a sign that the rhythm genre will once again become a niche category, where only the dedicated fan ponies up for each new iteration and hardware refresh. But PlasticAxe.com creator and GamePro contributor Joe Rybicki doesn’t believe things are as dire as they seem. Rybicki raises a valid point: because most gamers have already invested in the hardware, there is less incentive for them to purchase new guitars and drum sets. This, in turn, led publishers to continue developing titles that kept the same mechanics and concepts intact over multiple iterations; releasing a game that suddenly rendered the existing hardware obsolete or unusable would have shut out a lot of potential customers. But according to TheHeroFeed.com’s Guitar Hero lead editor Brian Shea, that lack of innovation in the genre was a major problem. “I don’t know if people are tired of [music games] but they don’t need ten releases in one year, that I can be sure of,” he says. “Music games are not as popular as they were and that may be because most casual gamers felt they needed to experience this phenomenon that they had seen on Ellen or the Today Show, or wherever. Now that they own a game or two, they’ve experienced it, checked it off their bucket list, etc. When a genre has such a huge year, as it did in 2007 when Guitar Hero was THE holiday gift that year — on par with the Tickle me Elmos, Furbys, and Cabbage Patch Kids of years past — it’s hard to match that year after year,” he said. So, in the face of mounting disinterest from a large portion of its audience, what’s a developer to do? Simple: shoot for a different audience. 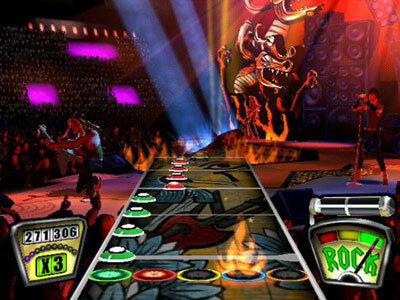 Activision’s Guitar Hero: Warrior’s of Rock, for instance, looked inward, hoping to appeal most to the fans who’d stuck by the series all along. Rather than cast a wide net, as the publisher did in years past, Warriors of Rock seemed to possess a much narrower focus. Unfortunately, the title received a mixed reaction, with review scores running the gamut from 9’s all the way down to 4’s. Some praised the game’s renewed focus on fun, challenging guitar parts, and Quickplay Plus challenges, but detractors were quick to point out the title’s lack of truly revolutionary features, essentially claiming that the Guitar Hero formula had gone stale. Seeing as Neversoft initially billed Warriors of Rock as a reinvention of the franchise, that’s probably not what the developer was hoping to hear. But in the eyes of Rybicki and Shea, the game is actually a success in a couple of key areas. It remains to be seen if that ‘true to life’ approach helps Rock Band 3 achieve greater success than its rival franchise. Developed by Guitar Hero’s original creators Harmonix, Rock Band 3 seems to have evolved into Warriors of Rock’s polar opposite. By adding two new instruments that closely approximate their real-life cousins — a Pro Model guitar and a keyboard — and giving players the option of actually learning how to play ‘real’ music in its Pro Mode, Rock Band 3 seems to be an attempt to evolve the genre beyond its plastic roots. In a genre desperately searching for a new direction, Rock Band 3 is a bold yet risky maneuver, one that Rybicki sees as the best hope for the genre in the coming days.